We’d love your help. Let us know what’s wrong with this preview of Green Lantern by Gerard Jones. To ask other readers questions about Green Lantern, please sign up. a really solid story that gets you in the mind of Hal Jordan, better than most that were told in the 80's. It might give you sympathy for his somewhat fragile psychology, considering what comes next in Emerald Twilight. Recommends it for: GL completists! 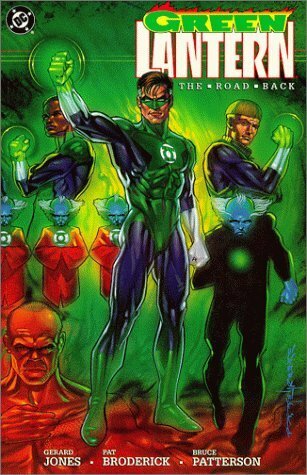 After reading several anthology tells about the GL Corps this brought things back to a good coherent storyline which veers nicely from character exposition, through hopeless plight, to salvation. It borders on the epic. There are several nice ambiguities - in particular the relationship between the three human Green Lanterns. Gerard Jones is an award-winning American author and comic book writer. From 1987 to 2001, Jones wrote many comic books for Marvel Comics, DC Comics, Dark Horse Comics, Viz Media, Malibu Comics and other publishers; including Green Lantern, Justice League, Prime, Ultraforce, El Diablo, Wonder Man, Martian Manhunter, Elongated Man, The Shadow, Pokémon, and Batman. Jones is author of the Eisner Award Gerard Jones is an award-winning American author and comic book writer. From 1987 to 2001, Jones wrote many comic books for Marvel Comics, DC Comics, Dark Horse Comics, Viz Media, Malibu Comics and other publishers; including Green Lantern, Justice League, Prime, Ultraforce, El Diablo, Wonder Man, Martian Manhunter, Elongated Man, The Shadow, Pokémon, and Batman.